I used with my 12, 9 and 2 year olds as a group lesson. Sample pages! When finished, click on BACK to return. This Bible study has thirteen lessons, each with six parts. It also includes a sample schedule. 3) Read the Bible passage. 5) Read "Think and Pray About It"
6) Pray for help with the principle in #5. This Bible study is very simple. A child of about 8 years and up could easily work his way through this book on his own. However, I decided to complete the book as a family. Each lesson is divided into 6 parts. One for each day of the week, except for Sunday. 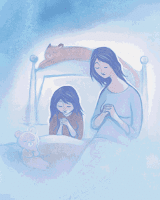 Each day that week, your child will read the same Bible passage and work on memorizing the same Bible verse. He will also answer a few basic questions. The questions give the passage, in case your child needs to look up the answer. Scattered throughout are little tidbits of information, thoughts to ponder, and mini history lessons. Lessons 1-5 work their way through the Book of Jonah. The remaining lessons work through the Book of Ruth, one of my favorite stories in the Bible. One of my other favorites, Esther, is also available as an Alone with God study guide. You won't have to worry about doctrinal issues, that something might be said that your family won't agree with. It doesn't discuss doctrine, just facts. For example, in Lesson Eleven's study of Ruth 4:1-8, here are some of the questions. 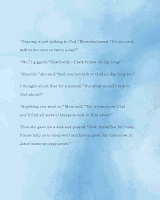 This book will give your child a complete overview of both Jonah and Ruth. They will complete both whole books of the Bible, by the time they finish the study guide. The lessons are short and simple. The informational sidebars are interesting and educational. The "Think and Pray About It" boxes really give you something to ponder and pray about. I liked the study guide. My daughters liked the study guide. I now have an even greater admiration for Ruth. Writing Tales was born out of the author's experience teaching a writing class to 3rd and 4th grade students in a classical co-operative. 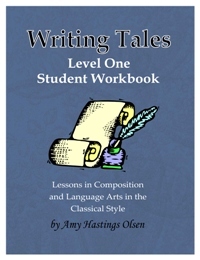 A desire to teach writing from the classical approach led to a need to make the subject more accessible and enjoyable, and a curriculum was born. 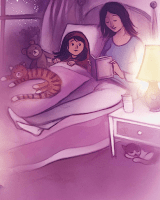 At the end of the 30 lessons, the student that finishes Writing Tales will have a treasure chest of fifteen well-written fables and fairy tales of their very own. Well, I am just going to through it out there. I LOVE, LOVE, LOVE this program. This is the way that I want to teach my children. How I wish I had been exposed to the classical method years ago, when my oldest was just starting out. Amy Olsen has done all of the leg work for you. The teacher's guide spells everything out. It tells about the story of the week. Gives a daily lesson plan. Shows the answers to the questions. Includes ideas for games to review skills. It even includes lesson plans for using the book in a co-op situation. The teacher's guide is huge. It has the lesson plans for a family situation. Then it has the plans for a co-op situation. Next are all the answers. Then all the "extra" stuff like printables for the games. It is very helpful, user friendly, and self-explanatory. A wonderful resource. The student guide is a winner before you even open it, because it is SPIRAL-BOUND. I love spiral-bound books. Each lesson has a similar format. Discussing the story, story ordering, copywork, vocabulary, types of sentences, oral narration. Plus spelling practice, grammar, writing the tales with a rough draft and final draft, outlining, creative details in story telling. 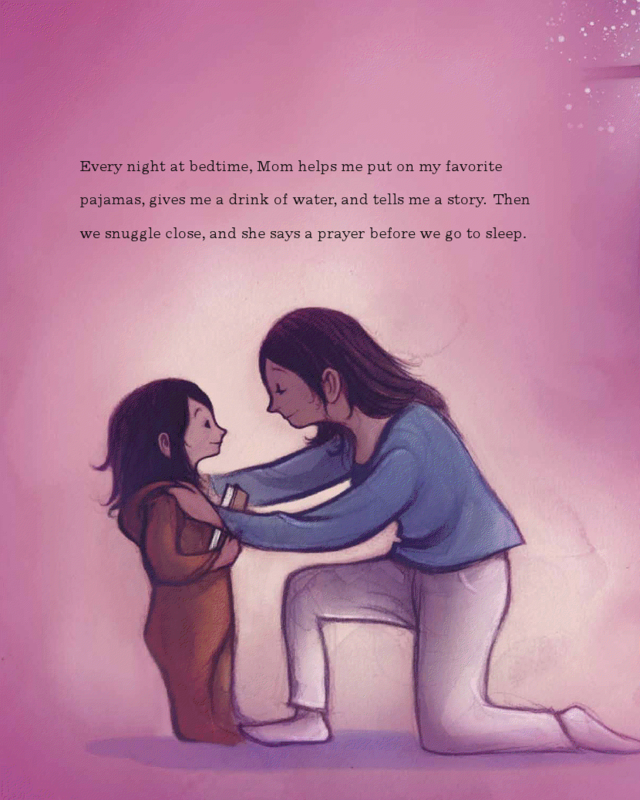 Each week, your child will get a familiar feel from the book. They will have an idea what to expect. I think this routine is a good thing. But even within this routine, there is much variety and so many creative activities that your child won't have a chance to get bored. Two of my favorite aspects are the copy-work and the writing lessons. I like the copy-work because it causes your child to slow down and do their best. To really concentrate on how their writing looks, and what their absolute best looks like. The reason that the writing lessons are my other favorite thing is a little more in-depth. Have you ever heard the philosophy that in order to learn how to be a great artist, you should practice by copying the works of great artists? Well, it is the same with writing. To be a great writer, you can read and write from great authors. 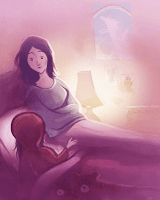 After reading a lesson's tale, your child will then write the story as accurately as he can from memory. No peeking back at the original story. Later, he will edit his work. Then, he will practice on any misspelled words. Next, have him add some creative details, taking liberties with the story as long as the gist of the story doesn't change. For example, in the Tortoise and the Hare, you can name the Tortoise, Sally and let the Hare pull out a sleeping bag while napping. But, for goodness sake, don't mix up the story and let the Hare win. And then last thing, your child will do a final draft - all edits made and creative details added. I LOVE these books. I plan to continue using these books long after the review period is done. Disclaimer: I received this program free of charge to review, as part of the TOS Homeschool Crew. The above is just my opinion. Please remember that opinions may, and do, vary. My daughters and I absolutely loved these books. 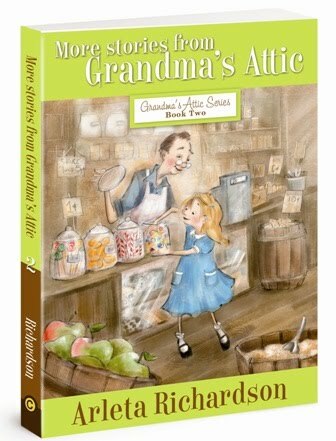 They are currently our favorite pick for read-alouds. Great books! need to have on hand in your drawing “toolkit” to always be ready to draw. IT ALL STARTS WITH A LINE — The most fundamental element of all drawing is the line – but not all lines are alike! Learn about different line qualities and the most essential skill of drawing – contour drawing. drawing. This is a true test of whether you draw what you SEE or what you KNOW! We received Art Lessons DVD 1 for review. I was curious to see how it would work out to have a personal art teacher on our TV. 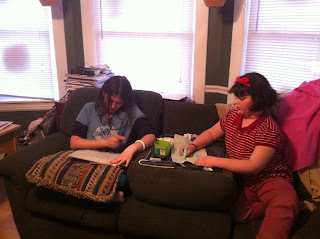 My children worked their way through the 4 art lessons by Pat Krepley. Well, really 1 lesson on what supplies we would need and 3 lessons on drawing. Then they watched the bonus lesson on chalk drawing by Gloria Kohlmann. The instructors were pleasant. The video and sound quality were good. The lessons were short and concise, focusing on one skill at a time. It was very user-friendly and student oriented. My children were able to sit down and do the lessons completely on their own. The lessons on this disc were very basic. Quite simple. It didn't challenge my children very much. But they did the lessons and did them well. And they learned something along the way. Besides, as I told my girls, you have to start somewhere. You start with the basics and work your way up. This is just the first few lessons of a complete series, that gets increasingly more in-depth. 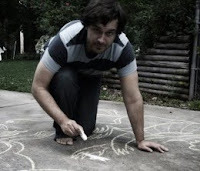 The chalk lesson was really cool. The way they shaded the different colors around was so neat. And the finished pictures looked very nice. This is a Christian program. Each lesson has a mini Bible lesson in it. Like I mentioned before, the first DVD is free for the asking. It is a good place for a beginner to start. And since it is free, it is a good way for the parent to get a feel for the program and see if it would be a good fit their children. Disclaimer: I received this DVD free of charge to review, as part of the TOS Homeschool Crew. The above is just my opinion. Please remember that opinions may, and do, vary. It is so important to teach our children to pray. 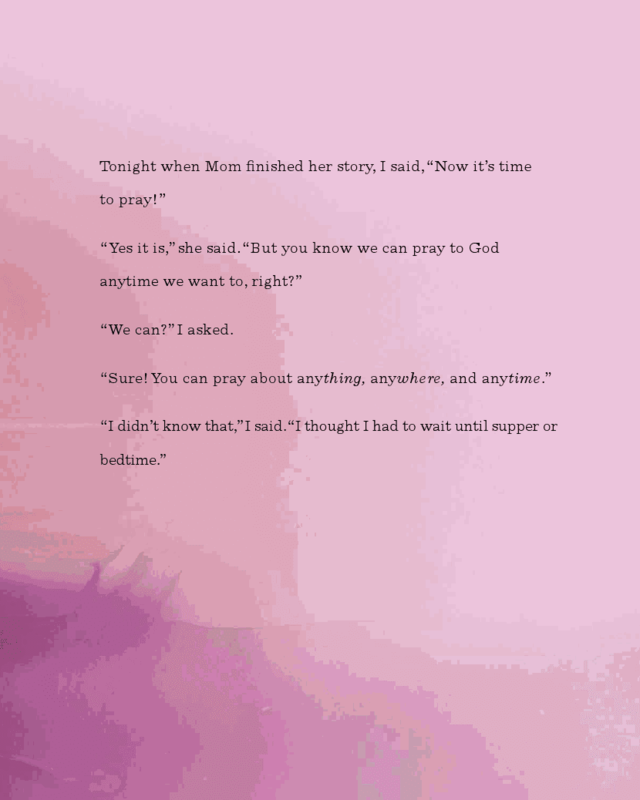 Not just to pray, but how and when to pray. How - Talk to God like you would talk to a friend, like you would talk to your Daddy. When - Anytime whatsoever. 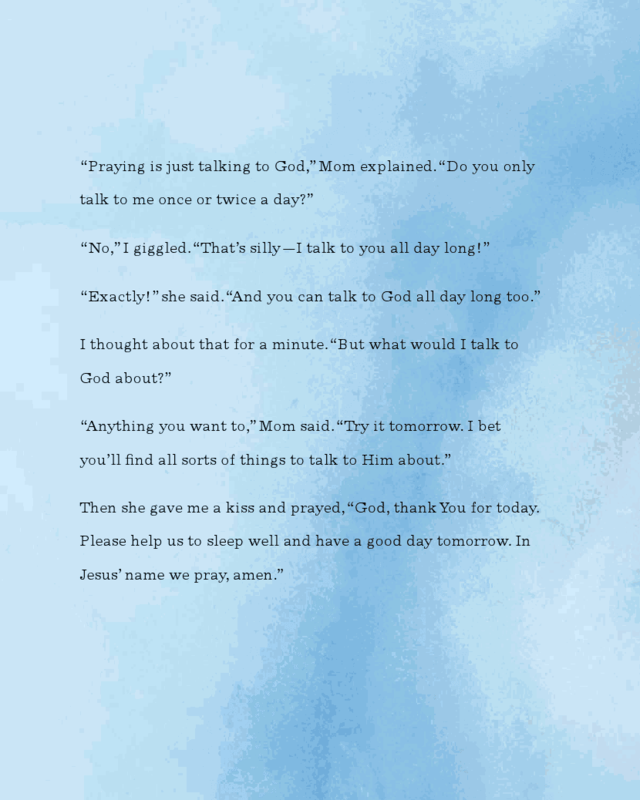 That is the lesson that this sweet little girl learns in That's When I Talk to God. Disclaimer: I received this book free of charge, as part of the FIRST Wild Card Tour. The above is just my opinion. Please remember that opinions may, and do, vary. I have to be honest. I was a bit put off by the title of this book. Regret free parenting. Yeah, right. I already have my share of regrets. And I had no desire to read a book that was going to slap it in my face. That was going to make me feel worse about than I already do. So for that reason, I almost decided not to choose this book for review. But God had other plans and led me to pick this book anyways. It was nothing like I feared it would be. 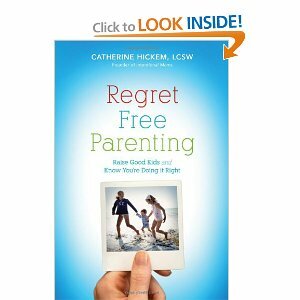 Catherine Hickem didn't write this book to put us on a guilt-trip. She didn't write it make us feel like a failure. Quite the opposite. She makes it very clear that we won't be perfect parents, never making a single mistake. But we can be intentional parents, following God's plan for us and our children. 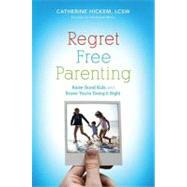 She offers insight into things from our own childhoods that might be affecting our parenting skills and style now. She gives practical tips about we can do the best we can to raise the best children we can, by God's grace and with God's help. One of my favorite lessons was about trusting your mom's intuition and recognizing your own value. God has made you the mom of your children, and as such He will provide everything you need to raise those children. Trust your intuition, listen to that still small voice. Don't value others' opinions over your own. Don't think the "experts" know what is best for your family. You are their mother. One of my other favorites was about learning from our pasts. Don't bring the pains of your childhood into your children's childhoods. Don't pass it on. Only look back for one of two reasons. Either to remember God's blessings in your life or to learn from your past experiences. I learned a lot about myself and was given hope and reassurance. I was encouraged to listen for God's still small voice and to trust God completely with the care and raising of my children. Regret Free Parenting is a winner in my book. 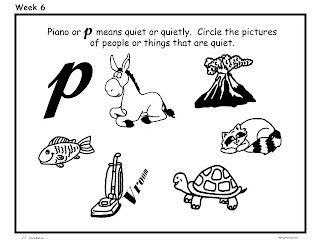 "KinderBach uses playful characters to teach note reading, rhythm, singing, and composition. Give your children the best foundation for brain development, all from the comfort of your own home!" Music is such an important part of life. But music lessons can be very expensive and time consuming. And many instructors won't accept students until a certain age. That is where KinderBach comes in. 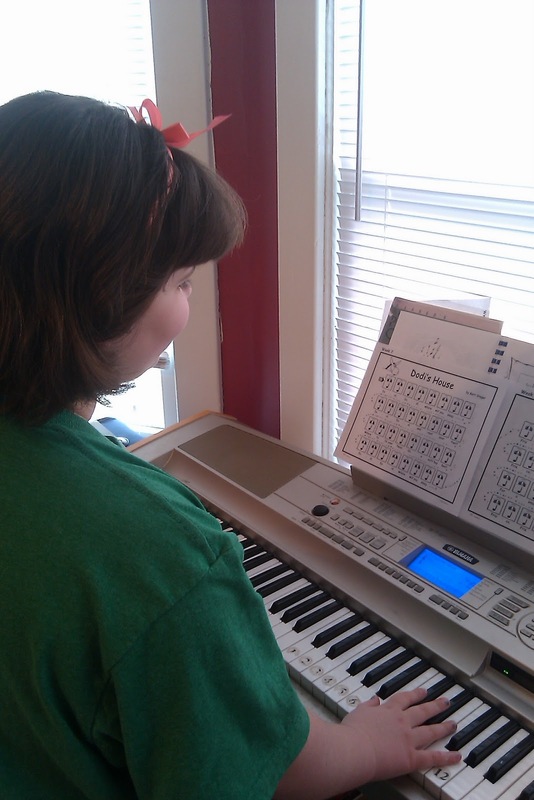 You can teach your child music in the comfort of your own home, at whatever time of day is convenient to you, for only $7.99 month (less than the cost of one private lesson), and you can start your child as young as 3 years old. Karri Gregor, the founder of KinderBach, is an author, illustrator and music educator. She has an extensive background in music, visual arts and drama. She was raised with a love of music and wanted the same foundation for her children. But when she couldn't find a piano teacher that would take a student younger than 7, she decided to begin teaching her own children. Later, she started teaching other younger students as well. She would tape the lessons so that those who missed a class could keep up. When Karri's family moved, she lost all of her students. So they had the idea to begin teaching with videos, so that she wouldn't have to worry about losing her students again. And she could also use her interest in the arts to "spice" up the videos. KinderBach is available on DVD. But the online version is much cheaper. The sessions are divided into 4 lessons per week. 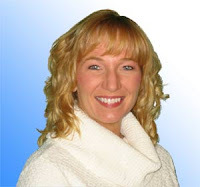 Each lesson includes a short video clip of Karri Gregor. 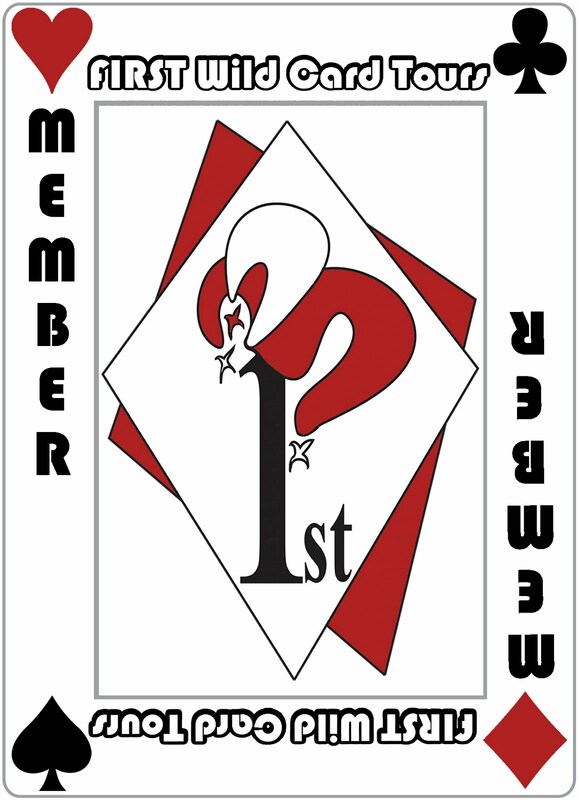 Some include short little crafts, coloring pages, etc to print out. 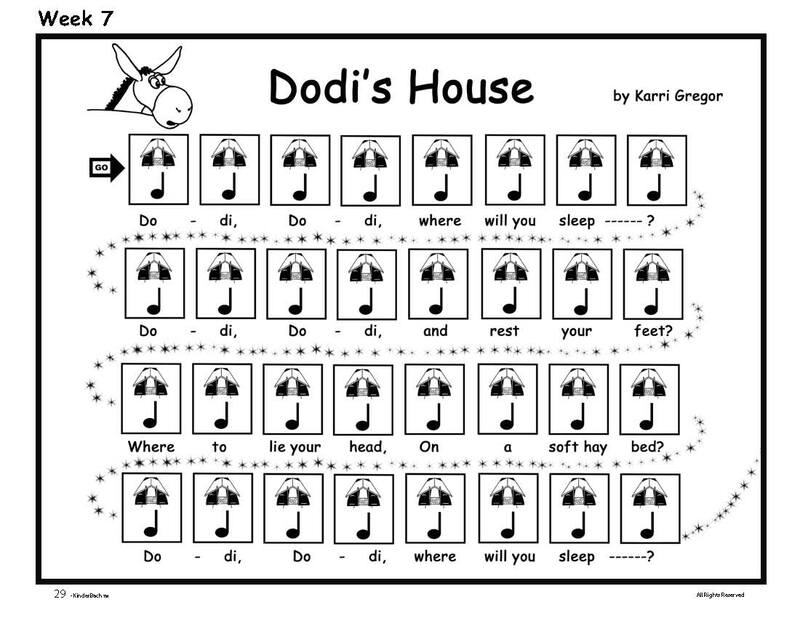 Scattered throughout are clips of Karri playing songs on the keyboard, for your student to play along with. Here is an example of a worksheet. Here is an example of a song in Week 7. You can download all of the pdfs, so that they are accessible to print as needed. This is the easiest way to do it. If you feel adventurous, you can print them all out at once and keep in a folder until you are ready for them. The program is very cute, user-friendly, and engaging. Karri is a delightful hostess: friendly, upbeat, encouraging. The lessons take it step-by-step, gradually increasing in difficulty as your child gains skills and confidence. Since my daughter is 9, she found a lot of the little activities to be too easy and too young for her. This is understandable as the recommended age is 3 to 7. I think a 3-to-7 year old would love the program. My daughter reviewed the program last year when she was 7, and she enjoyed most of the worksheets. 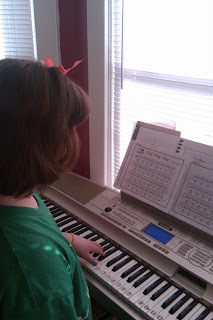 My daughter's favorite part of the program is actually playing the songs on the keyboard. They are just the right skill level for a beginner. Starting with the basics, and gradually working their way up. 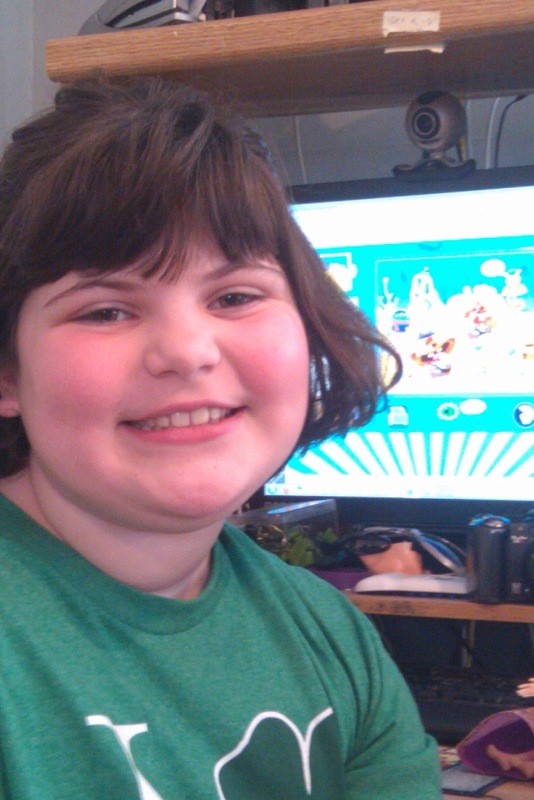 The songs are cute and catchy and easy to play. I catch my daughter singing the songs at random times during they day. 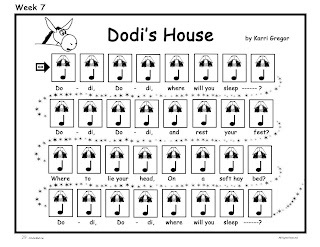 My 9yo playing "Dodi's House"
My 9yo playing "Chug Chug Chug"
We set our laptop up near our keyboard, so that we could easily go back and forth between the video lessons and the song playing. If your computer and piano are not near each other, it will be a little more of a back and forth thing, if you do more than one lesson at a time. You can also consider purchasing the DVDs. I am impressed with this program. It is a great introduction to the keyboard/piano for the little ones. 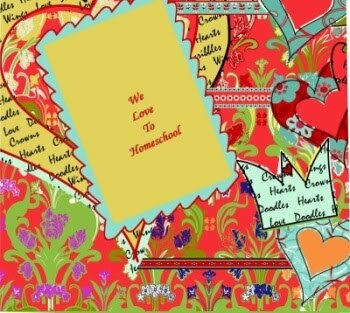 On the website, you will find FREE online lessons, a sample e-book, coloring pages and a song download. That is a good place to start. Disclaimer: I received a membership to KinderBach.com free of charge to review, as part of the TOS Homeschool Crew. The above is just my opinion. Please remember that opinions may, and do, vary. Launch reading skills with online brain games kids love. Explore a fantastical world where surprises hide around every corner and skating is a way of life with GoGo Kabongo's free online learning games. GoGo Kabongo is recommended for ages 4-7. I signed my 9 year old up for the program, thinking that she just might enjoy it also. She enjoyed it for a few days, thought it was fun. But then she decided that it was indeed too young for her. But when I asked her if she thought a younger child would enjoy it, she said they would like it a lot. Her favorite game is Photo Safari. 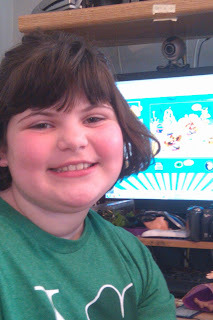 I also had my 12 year old play it a little while, just to get her thoughts and opinions about the game. She also thought that a young child would enjoy this site a lot. Her favorite pick is the "Make Your Own Comic". The game is geared towards the younger set, 4 to 7 years of age. It focuses on preschool and lower elementary skills. Finding the specified letters or shapes. Phonics. Duplicating a memorized pattern. Missing puzzle pieces. Reading comprehension. Following directions. Games start out simple and progressively get more complicated. Playing games earns rewards. Your child will have three choices for their prize. To add a piece to their skate park, to gain a piece of decoration for their tree-house, or to gain a comic maker sticker. The main hub of the game is the tree-house. This is where you decorate with the items that you earn as prizes, try out the comic maker, use the avatar maker, and visit the skate park. From here, use the map to choose from the 3 possible habitats. Your child's guides are friendly looking monsters with big smiles. They will give instructions and assistance along the way. 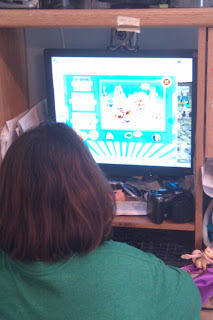 My 9yo did find it frustrating that the guides gave the directions to a game EVERY TIME she played. She would have preferred to hear it only the first time. Maybe an option to click for directions, instead of automatically having to listen to them every time. As a courtesy to the parents, Kabongo sends a weekly email progress report. It shows what games your child played, what level he is on, and what skills he practiced. This is a very cute game. Easy to learn. Easy to navigate. It teaches some fundamental skills to the preschool and early elementary set. It is fun and rewarding for the younger kids. It is also priced very reasonably. The first habitat is free. The next two are only $4.95 each. Disclaimer: I received the use of Kabongo free of charge, as part of the TOS Homeschool Crew. The above is just my opinion. Please remember that opinions may, and do, vary. 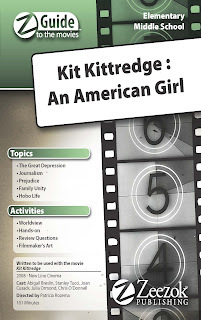 "Each Z-Guide contains a topic overview, movie synopsis, and ten learning activities for an in-depth study of the film . . . The goal of the Z-Guide is not just supplemental educational activities for specific historical topics, but to also teach the viewer to think critically." 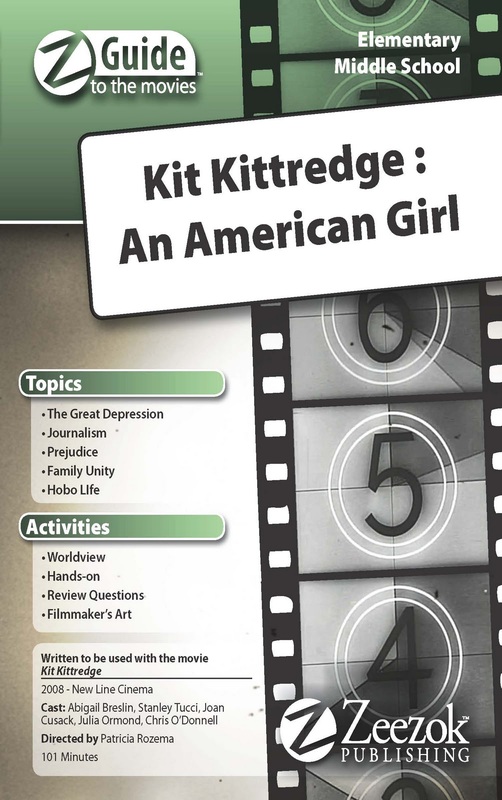 When Zeezok asked which Z-guide I would like to review, I chose the one for American Girl's DVD of Kit Kitteredge. 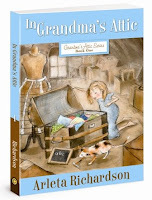 It was one of the guides geared towards the elementary age. Plus the fact that I know my daughters love all of the American Girl movies. So this would definitely be the one that interested them the most. The Z-Guide comes with a 5-day schedule of suggested use. The first thing we did was to read the "Topic Overview" as a group. I found this very interesting. It sets up the time period of the movie. Not so much what happens in the movie, but what is happening in "real-life" during this era. In our case, the era of the Great Depression. It explains a little about how it happened, with mentions of things such as Black Thursday. Some detail about how the government, specifically F.D.R. 's New Deal, tried to improve the situation. And some of the consequences that America, now a welfare nation, is still dealing with now. I always enjoy reading a little about the "story surrounding a story". Next, I read over the "Movie Synopsis". This tells a lot about the movie. A whole lot. And it does give away some of the twists and turns in the show. Because my daughters have seen the movie a few times already, this wouldn't be a problem. But if your children are watching the movie for the very first-time, use your own judgment as to how much you wish to reveal. Now it was time to watch the show. It is such an awesome movie, centering on the importance of families sticking together and working as a team during difficult times. A reminder that "When the going gets tough, the tough get going." And boy, was the Great Depression ever a difficult time! Activity 1 is "Movie Review Questions". Ours had 25 questions, with the instructions to answer the questions while watching the movie. The sheet includes instructions for scoring. But I chose to read the questions out loud as we went along and had the girls answer orally. After trying it that way, it wasn't a big hit for us. We found it to be a distraction from the movie. Had we never seen the movie, I think it would have been an even greater distraction. Next time, I would do it this way. Read the questions ahead of time. Watch the movie through. See how many questions the girls could remember the answers to. Then maybe watch the movie again the next day, with the goal of answering the rest of the questions. The Z-Guide includes 9 additional activities. Pick one or pick them all. I liked the variety, ranging from creative writing to family discussion questions to more in-depth research questions. My favorite was the page of hobo signs. After printing out a chart of some of the more common hobo signs, my girls deciphered the codes to read the messages. Then they made their own "secret message" using some of the symbols that they had learned. Rest assured, the guide includes an answer key. We borrowed a few books about the Great Depression to continue our study. Between the movie, the Z-Guide, and the books from the library, we have an awesome unit study going on. I think this is a really neat product. Zeezok has several Z-Guides available to use with some really great movies. Enjoy a great movie with your kids. Then take it to another level with some great ideas and activities to get your creative juices flowing. Gain greater insight into the history and time period of the show. It makes the history come alive, with life lessons that you will value. Disclaimer: I received this Z-Guide free of charge, as part of the TOS Homeschool Crew. The above is just my opinion. Please remember that opinions may, and do, vary.